Steph Curry in Nike Hyperfuse 2012 P.E. It’s hard to believe that someone who has led the NBA in most 50 point games during the 2015-2016 season (3) has a career high of only 54 points. If you sense a little sarcasm in my tone than you’d be correct. We’ve all seen the vines, gifs, replays, and highlights of Steph Curry on a nightly basis. His video game-like play is actually too much for video games. So it’s somewhat hard to believe that the Baby-Faced Assassin hasn’t gone for 60 or challenged Kobe’s 81 points. But then you pull back the layers, look at the number, and realize why. Steph Curry Layup in Nike Hyperfuse 2012 P.E. First off, the best player in the world takes quarters off, literally. And I don’t mean on the court, but his team is so good he generally doesn’t play the fourth quarter. Second, he’s shooting a career high in both two and three-point percentage while averaging 30.4 points in only 33.8 minutes a game. Third, when everyone knows he’s the best, there is no reason for him to overexert himself or play out of character when his team is on a historic roll. Regardless, he has gone off for 54 points and he did so on the biggest of stages, Madison Square Garden. It was the night of February 27, 2013 when Curry showed the world a glimpse into the future. Don’t forget that back in 2013 Curry had just signed a relatively small contract during the offseason to stay with Golden State. His daughter Riley was not even one-year-old yet and he was still wearing Nike. On that night, he was wearing a special colorway of the Nike Hyperfuse 2012 that he debuted during the 2013 NBA All-Star Weekend. 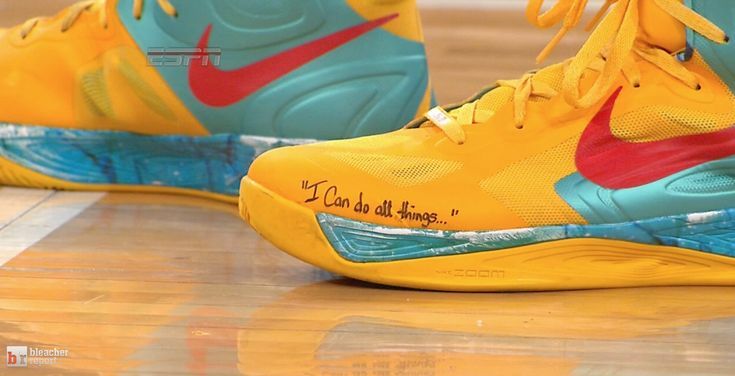 On the side of the sneaker Sharpied in was his favorite phrase “I Can Do All Things.” And that night he showed the world he really could. Steph Curry Jumper in Nike Hyperfuse 2012 P.E. The Warriors were short-handed with both forward David Lee and center Andrew Bogut missing the game. So, the Warriors needed their dynamic backcourt duo to have big games, but really they only needed a career night from one of them. Steph would play all 48 minutes of the game. During that time he made 18 of 28 shots along with going 11-13 from beyond the arc and breaking a franchise record for most threes in a single match up. He would become the first player in NBA history to hit at least ten threes and score 50 points in a game. That, along with making a perfect seven-of-seven from the free throw line, would make him finish the game with 54 total points. He also added seven assists and six rebounds to complete his stat stuffing night. The bad part for Steph? The Warriors lost the game 105-109. The Warriors may not have won that night but maybe it woke a sleeping dragon deep within Steph. On the biggest stage in the NBA Steph showed the world a hint of what he and his team could do. And since then, they haven’t stopped showing the amazing skills Curry possesses.